If you like to live on the edge and try out new updates to your favourite Steam games before they are released then you might like this tip. If you choose to proceed then you do so at your own risk! Under the “Account” tab click the “Change” button under the “Beta participation” section. 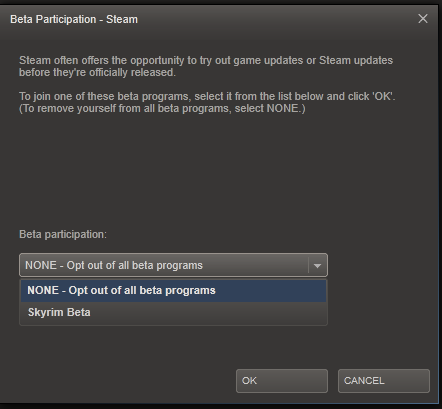 In the new window you can select which beta releases in which you want to take part and then click “OK”. You’ll be prompted to restart Steam after which your selection will be locked in. After that, it’s a matter of waiting! One thing to note, using beta releases of games could have some consequences such as crashing, abnormalities in gameplay and even corruption of your saved games.